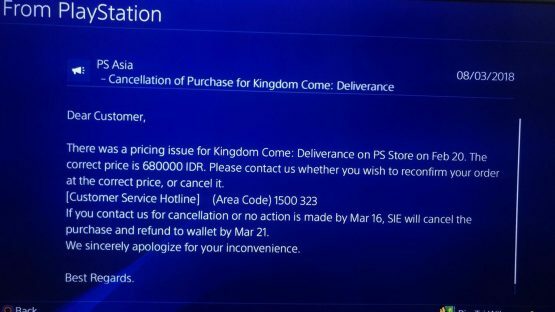 Over on the Indonesian PSN, a pricing error last month caused Kingdom Come: Deliverance to be available for the equivalent of only $0.05. A number of users took advantage of this, some even creating an Indonesian PSN to take advantage of the steep discount if they were outside of that region. It looks like Sony will be revoking all licenses for copies of Kingdom Come: Deliverance purchased under the pricing error. 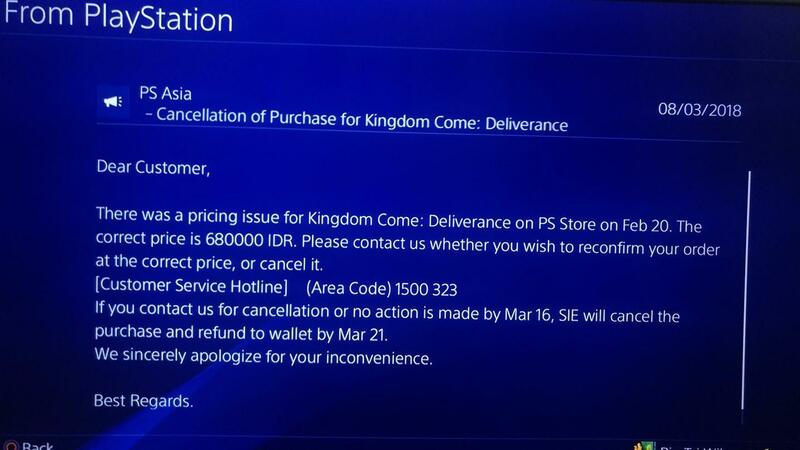 A message sent to users’ Indonesian PSN accounts indicates that Sony is first offering players the opportunity to pay the full purchase price to keep the game. Players have until March 16 to confirm if they want to keep the game at the full amount. After that, the purchase will be canceled, licenses for the game will be revoked, and refunds of the $0.05 used to purchase the game will be issued by March 21. Revocation of the licenses isn’t a surprising move. The attention that the Kingdom Come Deliverance pricing error gained, leading to many outside the region circumventing the system and getting it for next to nothing, likely forced Sony’s hand to attempt to recoup lost costs for the developer. Considering the pricing error was on Sony’s end of things, lost revenue would be their responsibility, having to pass on full price profits of each sale to Warhorse. This isn’t the first time it’s happened. Yakuza 6 had a similar issue recently where the demo granted access to the full game. The licenses to the demo were quickly revoked. It’s unclear what this will mean for players who attempt to go offline to avoid the license revocation, however, there are a number of fixes coming in future updates that those players would not receive. Those updates are include small quality of life fixes that will ultimately make the experience a better one. Players will have to decide whether they want to remain entirely offline until they finish a broken game, or pay full price to get a fixed game worth playing. It would also limit them from being able to play any other games online. Any connection would ping Sony and cause them to issue the revocation on the account. It amounts to an extended demo where players can now choose whether or not to purchase the game. Did you benefit from the Kingdom Come Deliverance pricing error, and if you did, will you be paying full price for the game, or letting the license get revoked? If you are on the fence, maybe reading our review will help.